The orphaned daughter of a sorcerer and a half-demon, Savannah is a terrifyingly powerful young witch who has never been able to resist the chance to throw her magical weight around. But at 21 she knows she needs to grow up and prove to her guardians, Paige and Lucas, that she can be a responsible member of their supernatural detective agency. So she jumps at the chance to fly solo, investigating the mysterious deaths of three young women in a nearby factory town as a favor to one of the agency’s associates. At first glance, the murders look garden-variety human, but on closer inspection signs point to otherworldly stakes. In my opinion, this is one of the most (if not THE most) highly anticipated novels of the series. Faithful Women of the Underworld readers have known Savannah for around ten books now, and I have been very anxious to finally get her story! I am happy to say I was not at all let down. The way things end make it clear there will be another book featuring Savannah (and Adam! *swoon*)…and I can’t wait for it either. 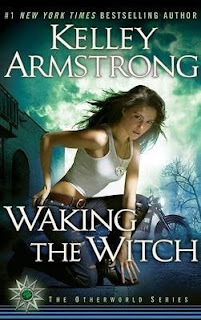 Don’t worry, it is not an annoying cliffhanger that will either make you mad or make you want to break in to Kelley Armstrong’s house for an unfinished manuscript…it just leaves you wanting more. The book moves quickly, and the mystery is fascinating. I definitely didn’t get it all figured out before the end. It is a nice mixture of the supernatural and good old fashioned suspense: the combination makes the book a very fast read because you won’t want to put it down. If you haven’t read the series, I would definitely recommend starting from the beginning (with Bitten) and reading them all…but you can pick this book up and read it as a stand-alone without a problem. Reading the rest of the series just gives you a bigger frame of reference for the world the characters live in and makes you more invested in what is happening with Savannah. The world Kelley Armstrong has created for this series (and the young adult Darkest Powers trilogy) is fascinating. The magical characters and witchcraft all work together and make the world so complex and thrilling. I love all these books! This particular book features witchcraft mainly, but other characters featured in the books include werewolves, ghosts, physics and vampires. Either way, I definitely recommend reading this book. Thanks to Dutton, I have two copies of the book to give away! Thanks for the review. Very informative. I hope I win the giveaway. I can't wait to read it. Sounds awesome. I'll have to check out the whole series.